Venezuela’s top military representative to the US has defected from Nicolás Maduro’s government. Col José Luis Silva says he now recognises opposition leader Juan Guaidó as president instead. Mr Guaidó declared himself “acting president” on Wednesday, gaining the backing of several countries including the US. Meanwhile, Mr Maduro has rejected demands by European countries to call elections. Several countries including Spain, Germany, France and the UK said on Saturday they would recognise Mr Guaidó as president if elections were not called within eight days. “They should withdraw this ultimatum. Venezuela is not tied to Europe. This is complete insolence,” Mr Maduro told CNN Turk. President Maduro was sworn in for a second term earlier this month after an election marred by an opposition boycott and allegations of vote-rigging, leading to large anti-Maduro protests. Why is Col Silva’s defection significant? Tens of thousands have protested against Mr Maduro, but, crucially, he has retained the support of the country’s military so far. The security forces are seen as the key player in this crisis, and Mr Guaidó has asked them to “put themselves on the side of the Venezuelan people”. 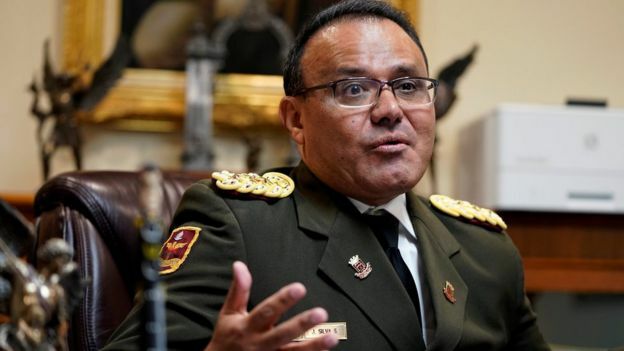 In a video, filmed at the Venezuelan embassy in Washington, Col Silva called for free elections and urged his “brothers in the armed forces of the nation to recognise President Juan Guaidó as the only legitimate president”. “The armed forces have a fundamental role in the restoration of the democracy in our country. Please, brothers, do not attack our people,” he said. Later, he told Reuters news agency that two other Venezuelan consular officials in the US also recognised Mr Guaidó as leader. Image captionCol Silva appealed to the military, saying: “The state has given us weapons to defend our country, not to attack our equals”. It is not clear whether more members of the military will be encouraged to defect. Mr Guaidó thanked Col Silva and urged others to join him, while Venezuela’s defence ministry said Col Silva was guilty of treason, and tweeted photos of him with the word “traitor” on it. Subordinarse ante los intereses internacionales es un acto de traición y cobardía con la Patria heredada por nuestro Libertador Simón Bolívar, por ello, repudiamos las declaraciones por parte del Cnel. Jose Luis Silva Silva, quien desempeñaba cargo como Agregado Militar en EEUU. Meanwhile, Mr Maduro has backed down over his demand that all US diplomats leave the country. 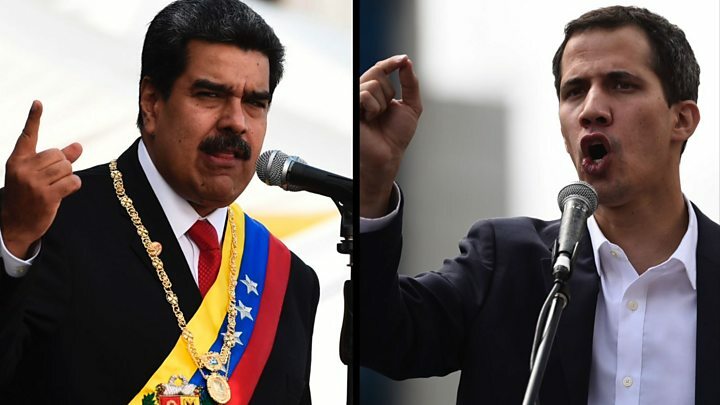 Mr Maduro, accusing Mr Guaidó of attempting a coup, broke off relations with the US on Thursday and ordered US envoys to depart within 72 hours. Washington said it did not recognise his authority to order them out. 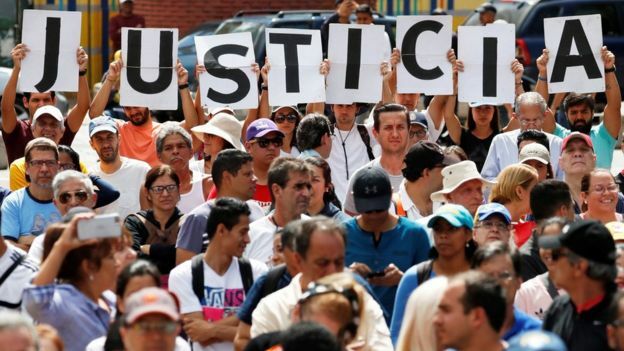 On Saturday evening, as the deadline was due to expire, Venezuela’s foreign ministry said it would withdraw the expulsion order, and instead allow 30 days for the two sides to set up “interest offices” in each others’ countries.